One of the most popular events is the Smoky Mountain Wine Weekend, presented by Courtyard by Marriott, held in downtown Gatlinburg, Tennessee. Perfect for bachelorette parties, mother-daughter trips, a weekend catching up with high school friends, or romantic escapes, this wine-filled event features the best from local wineries, so you can sample and sip away. And of course, they’ll have some great local foods to nosh on while you enjoy. What could make this better? The backdrop of the gorgeous Great Smoky Mountains! The 2019 Smoky Mountain Wine Weekend will kick off with the Gatlinburg Wine Tour on Friday, April 12. You can register and check in from 5 – 6 p.m. before getting started on the tour at 6 p.m. There are limited tickets available, so please be sure to RSVP and get your tickets ahead of time! Once the tour’s over, you can grab a bite to eat or head back to your cozy cabin for a night of relaxation and rejuvenation before starting again the next day! With 5 wineries located within 12 miles of each other – beautifully situated in the Great Smoky Mountains – Rocky Top Wine Trail is one stop you don’t want to miss on your trip to Gatlinburg or Pigeon Forge. Tours are always free, and if you grab a passport at the first winery and get it stamped at each stop you make, you’ll get a FREE logo wine glass after 3 locations and another FREE gift if you visit all 5! After you’re done touring and tasting, you’ll want a great place to take back your selected bottles of wine or just relax and unwind. 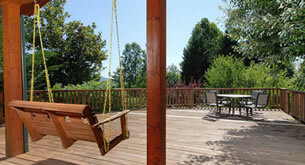 Our Gatlinburg cabins and Pigeon Forge cabins are perfect picks. Packed with amenities, they feature perks like outdoor hot tubs, mountain views, indoor jetted tubs, big screen TVs, fully equipped kitchens (where you can whip up your own wine pairings), and more! Some even have private indoor pools, game rooms, and movie theaters!